They can solve my people's worries. They can bring abundance to my people's property. Lyrics are poems 236, 237 and 238 in the Shi Jing, by tradition compiled by Confucius. This piece invokes Yan Hui, the favorite student of Confucius. "Yasheng" suggests "second only to Confucius himself", and Yan Hui was one of a few people so named. Musical setting of The Great Learning and a commentary by Zhu Xi; used for Confucian ceremonies? Same theme as #2 Yi Lan, but unrelated melodies (there are several versions). This melody, also called Qizhao Shi (Good Advice Poem, from the Zuo Zhuan; Watson, p.167) concerns 祭公謀父 Duke Moufu of Zhai (on Yellow River north of Zhengzhou, Henan) giving good Confucian advice to an early Zhou king. The version in Japan is a setting from the Doctrine of the Mean, Chapter 26. The version in Japan is a setting from the Doctrine of the Mean, Chapter 27. 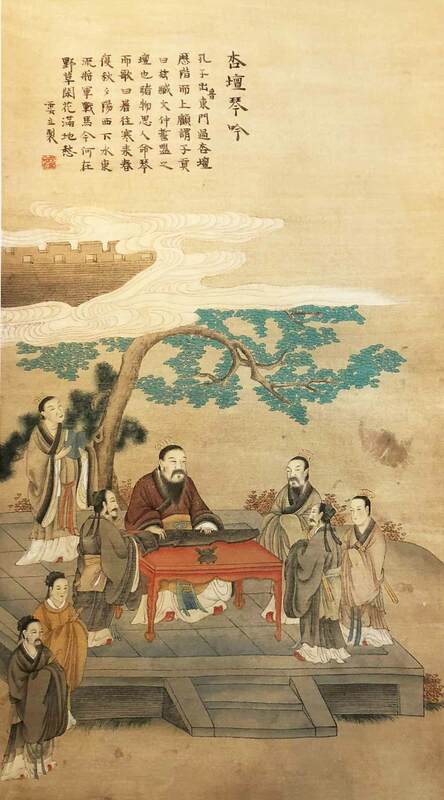 Many such images can be found as woodblock prints in 孔子聖蹟圖 Sagely Relics of Confucius; only the ones above by Bai Yunli are copyrighted here. 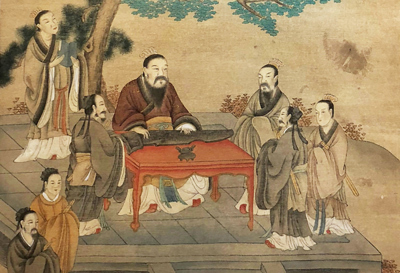 On the internet there are many other images of Confucius playing the qin. 望雲思親 Wang Yun Si Qin (Looking at the Moon and Thinking of One's Parents, which concerns Confucian values [and is attributed to "Judge Dee"]). Perhaps the two best known of these are listed in the Zha Guide as 韋編 Wei Bian and 讀易 Du Yi (with variants); these are discussed further here. In sum, although the stories of the Wei Bian and Du Yi seem to be similar, the two Wei Bian melodies are musically unrelated to each other, and neither one seems to be musically related to any of the Du Yi melodies. However, this is a preliminary opinion based on examining the tablatures, not actually playing or hearing all the meloides. Perhaps further study might show that there are indeed musical relationships between them. "In his old age Confucius loved to study the Book of Changes, the order of the hexagrams, definitions, appendices, interpretations, explanations and commentaries. He studied this book so much that the leather thongs binding the wooden strips wore out three times. "Give me a few years more," he said, "and I shall become quite proficient!" Zha Guide lists Wei Bian as only in the hand-copied 琴書千古 Qinshu Qian'gu (1738; XV/444), where it has 7 sections, its mode is not indicated, and it has no commentary or lyrics. Zha's statement, p. 39, that the melody is "明代民間 from the people of the Ming dynasty" should be seen basically as a political statement, not historical. To my knowledge this melody has not yet been reconstructed. Zha Guide does not mention Leather Bindings Broken Thrice (韋編三絕 Weibian Sanjue). The melody of this name has been transcribed in Guqin Quji, Vol. 1, pp. 265-7, where it is divided into three sections. Commentary with the earliest known recording, by Le Ying, included in CD #6 of the China Records 8-CD set of recordings from the 1950s, identifies the melody only as from 抄本琴譜 hand copied tablature, but a comment at the front of the tablature/transcription in Guqin Quji (p. 265) says its source is 賈闊峰傳譜 tablature transmitted by Jia Kuofeng, who was Le Ying's teacher. The brief commentary on p. 10 of Guqin Quji says that the melody survived only though that hand-copy, no printed scores. It then suggests that this modern melody is related to that of the Wei Bian in the 1738 handbook and points to the story shared with Kongzi Du Yi. However, as mentioned above, my own tentative examination comparing the two Wei Bian tablatures did not reveal any musical relationship between them, nor any between either of them and any of the Du Yi melodies mentioned next. (Paraphrase:) Friends liked to read aloud the Yi Jing on autumn evenings, and the sound inspired the writer to create this melody (see also du shu sheng). Kongzi Du Yi; said to be "閩派 Min pai" (Fujian school) but "from 孔山 Kongshan". No other commentary. Recordings of this by 曾成偉 Zeng Chengwei, which are very similar to this tablature, are said to be 蜀派 Sichuan school. Seems unrelated to the other versions. Du Yi; 3 sections; I have not yet seen the tablature. This is music by Li Xiangshi, should be played in the style of the Sichuan school, and especially at the beginning is quite pleasurable. (Comment by) Ye Shimeng. The introductions to Du Yi do not actually mention Confucius except where his name appears in the title (i.e., the Kongzi Du Yi from 1876). Nevertheless, from the titles it would seem that the theme of the Du Yi melodies might be similar to that of the Wei Bian melodies. Again, although further study might show that there are indeed musical relationships between the Wei Bian melodies or between them and the Du Yi melodies, until that time one should be skeptical of the claims one can read that 韋編三絕初見於《琴書千古》（1738，抄本）Wei Bian San Jue can be traced back to 1738. In fact it has not even been traced back prior to Le Ying and/or his teacher. It should be needless to add that, though criticism of the commentary, this is in fact praise for the performer. See under Confucius: a collection of stories attributed to Confucius but most probably dating from the Han dynasty. Quoted variously on this site: see especially the six selections from four books.